Long gone are the days of hiring a computer whiz to build your website. These days, anyone can create a website using a variety of different services that make it both easy for the less tech-savvy, while also remaining relatively affordable. While building and designing a professional website has gotten more straightforward, the one thing that hasn’t changed is the process of picking a domain name and registering it. To register your website’s domain name, you will need the services of a domain registrar. They are abundant online, and many are better than others. In this article, we’ll discuss our top ten online domain registrars, what makes them so great, and how you can get started today! A domain name registrar is an online service run by professionals that helps users register and purchase domain names. Many domain name registrars are accredited by ICANN (Internet Corporation for Assigned Names and Numbers) which means they are professionals and provide their clients with services backed by the nonprofit organization responsible for issuing domains. Domain name registrars are essential to building a website and the expansion of the Internet—if we didn’t have domain names for our sites, finding your favorite website would require you to memorize a long string of numbers or the IP address. Domain names make the Internet easy to use and accessible for most everyone. When you go to a registrar with your domain name idea, a few things happen to make your domain legitimate. Firstly, the registrar will coordinate with ICANN who manages the root domain (the “dot” in .com), and then the registrar will contact the “.com” operators so they can update their database so the people on the Internet around the world will be able to view your website. Do You Need a Registrar? The short answer: yes. While ICANN controls the domains, you can’t skip the middleman (domain registrars) and buy a domain directly from ICANN. They work much like a regular factory; they sell their product (domains) wholesale to retailers (domain registrars) which then provide them to consumers. 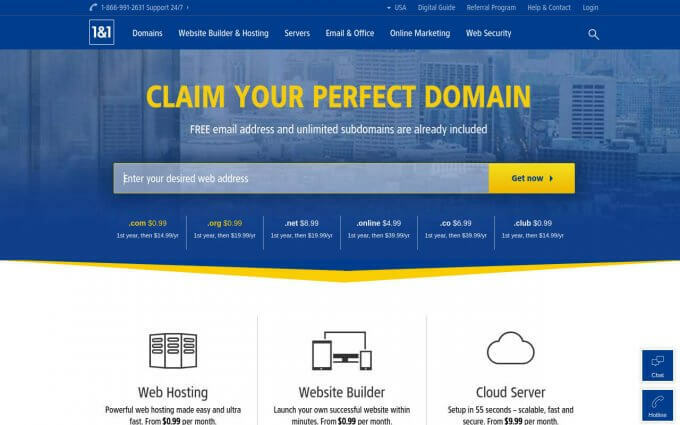 There are some instances where you can build and host your website and domain without a registrar; however, your site won’t be visible to the rest of the Internet. Domain registrars use software and equipment called a Domain Name Server to manage and store all of the domain names for their clients. Technically, you could build your own personal DNS and configure whatever domain names you would like. The only problem is that because you aren’t accredited by ICANN your domains would be invisible to the rest of the internet. 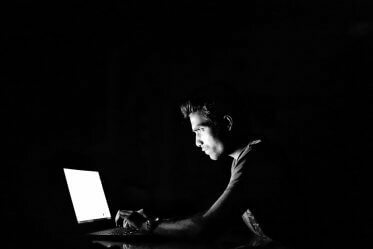 This might be a solution in some cases such as a corporation seeking their own DNS system configured for their internal websites for employees. Because they don’t want or need the rest of the internet to see their sites, having their domains in a registrar’s DNS isn’t necessary. Can You Become Your Own Registrar? It is possible to be accredited by ICANN if you meet their requirements. The annual expenses for this accreditation are very expensive, so this option is only for large corporations with thousands of domains. Paying a registrar for each of those domains might be more costly than becoming accredited by ICANN. All that being said, if you are a small business or don’t have the need for private domains, you need the services of a domain registrar to make your website public. 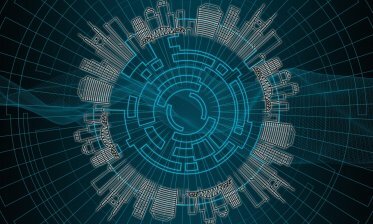 As we’ve mentioned previously, ICANN controls all of the domain names on the internet, and you should only be doing business with a domain name registrar that is fully accredited by ICANN. 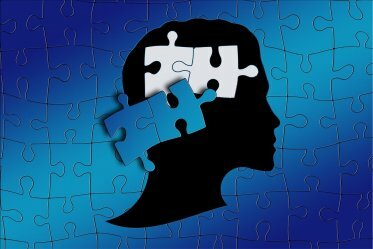 When visiting their site, they should have information mentioning their accreditation. When comparing the different domain name registrars, your primary focus should be on their pricing options. When you register a domain name, it is for a period of either one, three, five or ten years. For your first website, it is often recommended to only register it for one year to start with in case you change your mind you won’t be locked into a contract. If you decide you love your domain name, you can turn on automatic renewal to ensure that your domain never goes offline and is snatched up by a competitor. Also look for any hidden fees such as domain transfers, renewal costs, and anything else they might add. Some domain registrars will offer additional services to their users to provide them with a one-stop shop for all of their website needs. Common additional services include domain hosting, website building, SEO, and SSL certifications for your domain. If you need more help with your website, choosing a domain registrar with additional services might be an excellent option for you. You want to work with a domain registrar that is easy to get ahold of if you run into any problems or have any questions. If your website goes down, the last thing you want to do is sit on hold waiting for a representative to get the site back online. Make sure you research the registrar’s customer service record online and see what their other customers are saying and also check their website to view their compliance policies. When first launching your website, you most likely will stick with your registrar for a while, however, in the future, you may want to transfer your domain over to a new registrar. Before selecting your registrar, make sure that you take a look at their transfer policy, so you know what to expect when it comes time to transfer. Many registrars won’t allow their customers to transfer within the first 60 days of registration, while some may not allow transfers at all or will charge a fee. Be sure you consider this when choosing your registrar. In any service industry, you’re going to run into hidden fees, whether it’s your cell phone plan or the guy that mows your lawn twice a month, hidden costs are everywhere—it’s just a part of life. 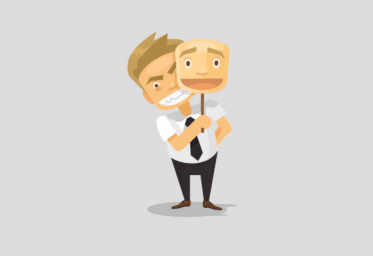 Your job is to ensure that you avoid as many hidden fees as possible. When reviewing your options, be on the lookout for auto-renewal fees and penalties as they are the most common add-on fees for registrars. Keep this in mind when you see domains advertised at unbelievably low prices because chances are there are tons of costs that are tacked on. After you’ve registered your domain name, you’ll still need to set up a few things to get your website online. Most commonly, you would need to set up DNS servers, install a Content Management System (CMS) to manage your site, and also create any “@yourwebsite.com” email addresses. This is why using a registrar with a user-friendly and straightforward domain management system is essential. Without an easy to use domain management system, doing any of the necessary tasks that go along with managing a website can be a constant headache. Be on the lookout for domain registrars that are known to have simple domain management systems, especially if this is your first website. All that being said, here are our top 10 domain registrars to save you time and research so you can get started on your website today! Chances are you’ve seen GoDaddy’s Super Bowl commercials over the year. They do things a little differently there, but one thing is for sure, they are the leader of the domain name registration market. 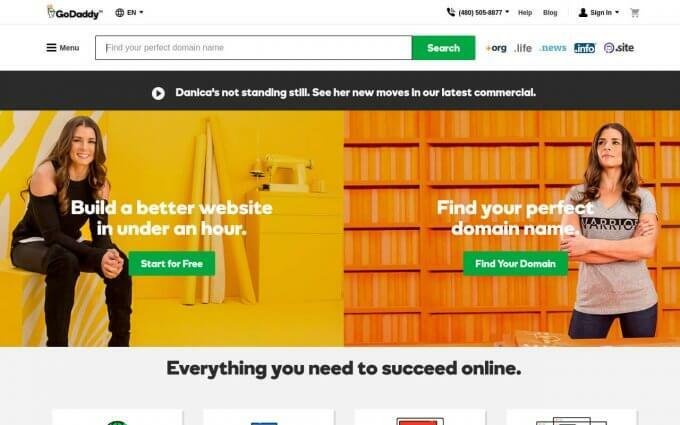 Recent data shows that GoDaddy has around 43 million domain names on their servers which equate to approximately 12.5% of the total market share. GoDaddy is always ahead of the curve, and this worldwide ICANN accredited registrar offers every type of top level domain (TLDs) you could imagine including country-specific names (.co.uk, .ru, etc.) and new generic ones (.blog). They offer reasonably affordable rates and run domain name auctions where users can bid on existing domain names. If you are just starting your very first website, HostGator is not a bad registrar to choose. Although most commonly known for their hosting services, they will also register domains. If you are in need of both domain registration and website hosting, they offer bundles for as low as $4.99 a month. 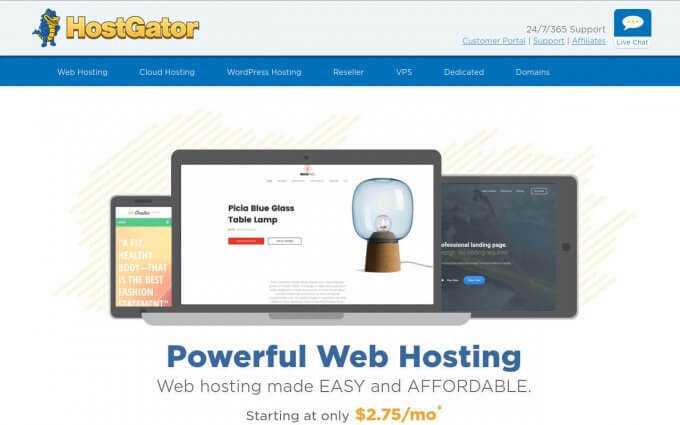 Perhaps the best attribute of HostGator is that they have a 99.99% uptime for almost 2.5 million websites that they currently host which means that on the off chance that your site ever goes offline, they will catch the problem immediately and minimize your downtime. Dreamhost will host websites as well as register domain names. This registrar has been around since 1997, giving them decades’-worth of experience in this market. They have domain name extensions for anything you could possibly imagine as well. Also, one of the free added perks of working with Dreamhost is that they include free domain privacy and control over the domain settings for the user. If you are just starting your first website and want to register and host with the same company, Dreamhost might be a good choice for you. 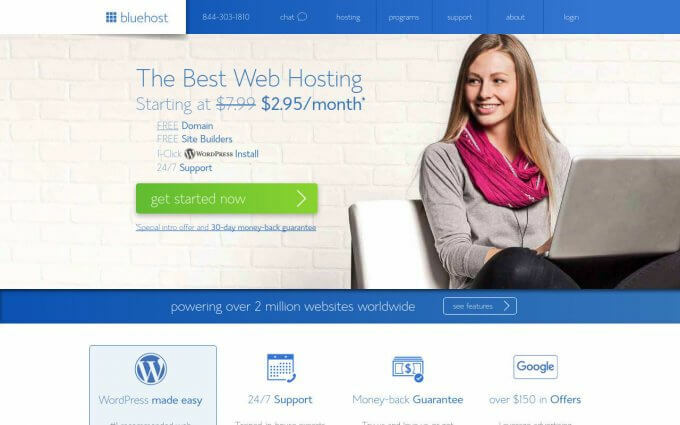 If you’re looking for hosting services in addition to your domain name, BlueHost will throw in a free domain name when purchasing their website hosting services. 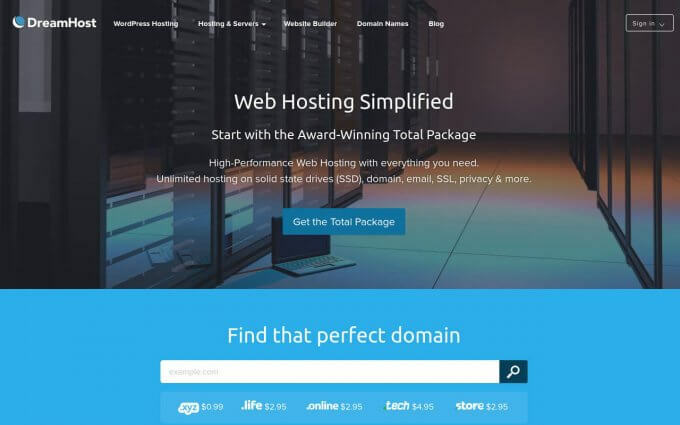 If you aren’t looking for hosting services, they will still register a domain name for as low as $5 a year with WHOIS privacy protection for an additional $1 per month. One of the reasons BlueHost is so successful is because of their 24/7 customer support system. You can call, chat online, or email to ask their experienced team any questions you may have, or you can watch their tutorials if you are more of a do-it-yourself type. With over 5 million unique domains on their servers, 1and1 is an old registrar with years and years of experience registering domains across the globe. 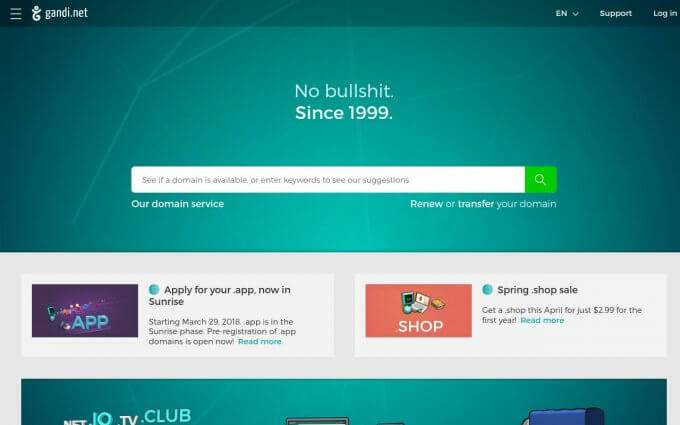 They offer affordable domain names for as low as $0.99 for the first year. They also offer customers website building tools, website hosting, and eCommerce solutions. They don’t add on any hidden fees from ICANN or anything, so you can rest assured that the price you see on the site is the same price you’ll see during checkout. If you are looking for a registrar that combines a stellar support system with affordable domain registration rates, NameCheap might be the best option for you. 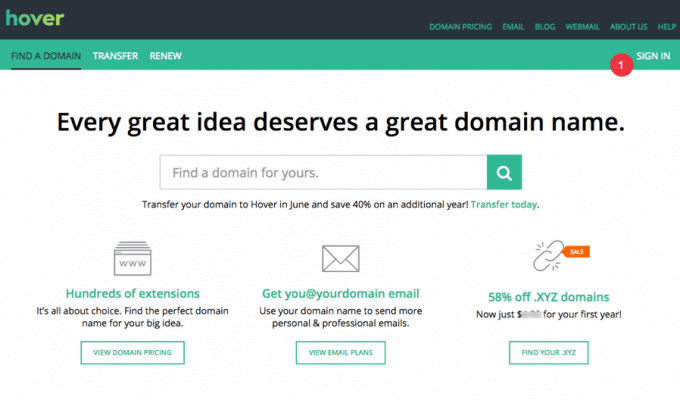 They offer a decent selection of top-level domains at dirt-cheap prices starting at $0.50 a year for some domains. They also provide WHOIS privacy protection, guaranteed uptime for $5 a year, as well as SSL certificates for as low as $9 per year. 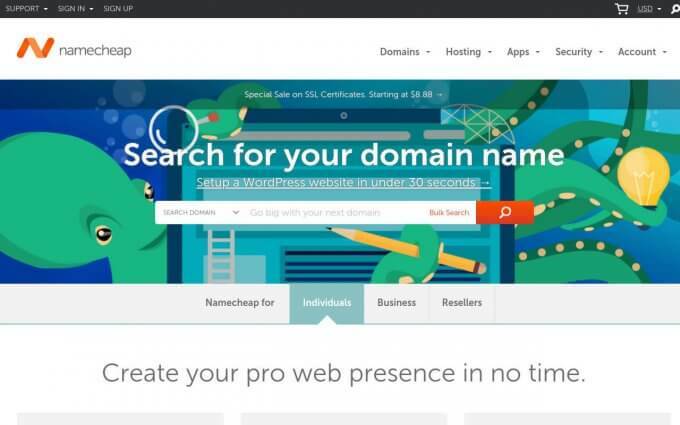 Additionally, when you register a domain name with NameCheap, you receive a year of WHOIS services and two months of their private email services. Enom is one of the largest domain registrars on the web. They are ICANN accredited and can register domains from around the world thanks to their expansive network of sister companies. Enom offers domain name extensions for a handful of countries, along with the classic extensions and newer generic TLDs. They also provide additional services such as SSL certificates, WHOIS privacy protection, and website building tools for an additional fee. Additionally, Hover throws in free WHOIS privacy protection with all of the domain registration packages as well as an email forwarding feature starting at $5 per year so you can get started sending emails to your customers, friends, or family with your new fancy email address. 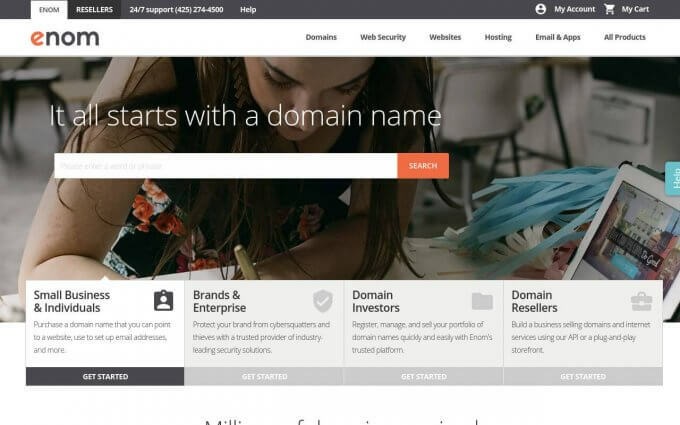 One of the grandfather domain registrars on this list, Gandi has been in the business for nearly 20 years and provides a clean and simple “No B.S.” approach to their services and sales tactics. They won’t ever sell you something you don’t need, and they provide the simple services of registering domain names at meager prices. Some domain names start at $0.50 per year while more modern domain names can go for around $15.50 a year. Gandi also includes WHOIS privacy protection for free with all of the domains that they register along with two free inboxes, 1,000 aliases, and LiveDNS options. If you are looking for straight-forward pricing options, a variety of tools to help you create the best website you can, Name.com may be the choice for you. They offer a range of different online tools including hosting, website builder, and email. 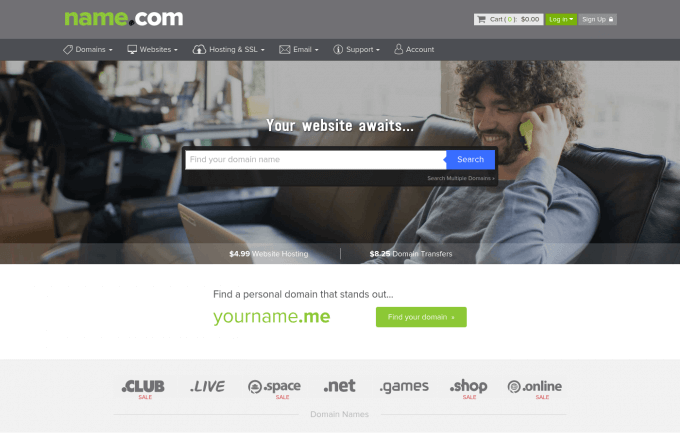 To see which domain names are available, Name.com offers a convenient search bar directly on their website to help save you time. Their prices are relatively affordable starting at $10.99 for a .org address and $12.99 for a .com or .net. If you are looking for a one-stop shop for your first website, this may be the registrar for you. Ideally, you’ll stay with your registrar for the entire life of your website so be sure that you identify your needs before choosing a registrar. Are you looking for your first domain registration or are you trying to transfer your domain from another registrar? Is price your biggest concern or would you like the comfort of knowing that customer support is available 24/7 whenever you need it? These are the questions you need to ask to determine which registrar you should work with. All of the companies on this list are excellent choices, and it will ultimately come down to what you are trying to get out of these services. CDN would provide the right solution for a website that has a poor loading time as a result of excess images and videos. This post is worth sharing. I cant cope with a site that is always down; an unacceptable downtime is a turn off to site visitors who are likely potential customers. Domain name registration is a booming business that has witnessed the entrants of some not so good professionals. So it’s important to get connected with the right service provider. Still trying to figure out the requirements that would enable me to be ICANN accredited. I can attempt starting a business in that line. The use of domain name has made things easier as compared to memorizing some complex figures or IP address. Pretty cool. I’ve used a handful of these suggested domain registrars. The best still remains godaddy! They give amazingly great discounts for the first year of registration and quite cheap renewal prices. Their customer support is also nice. Yeah. Getting a good domain registra is not a child’s play. 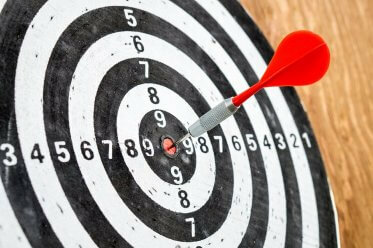 These days, you find new domain registrars coming up with mouth watering prices for domain names. But when you take the bait, you would regret the decision every single day. My advice, follow the above tips before picking a registra to hand your domain registration to.